Everyone deserves a second chance. 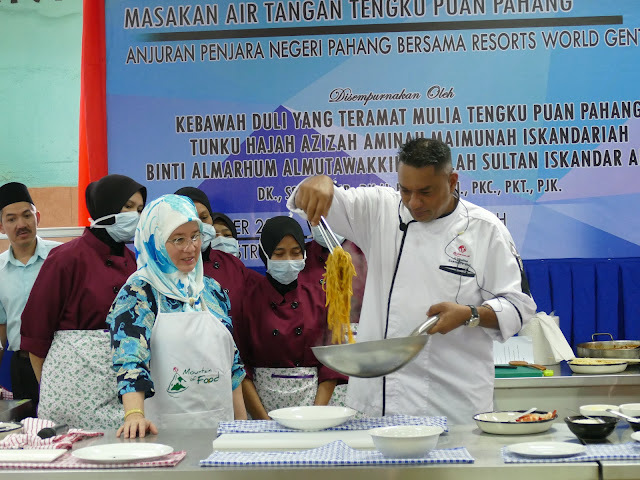 Kebawah Duli Yang Teramat Mulia Tengku Puan Pahang Tunku Hajah Azizah Aminah Maimunah Iskandariah Binti Almarhum Al Mutawakkil Alallah Sultan Iskandar Alhaj certainly believes that, as Her Royal Highness directed the creation of a programme dedicated to rehabilitating female inmates through culinary skills. Announced during the Program One Touch Wanita, Masakan Kasih Sayang Dan Perniagaan event in October 2018, the auspices of Her Royal Highness saw the inmates of Bentong Prison equipped with work skills meant to be useful to them when they are re-integrated into wider society. Titled ‘Beauty Behind The Wall’, the programme kicked off on 25 November 2018 at the Bentong Prison’s Pastry Workshop, supported by Resorts World Genting. The event was attended by Ybhg. KP Dato’ Ab Basir bin Mohamad (Pahang State Director), Ybhg KP Dato’ Abdul Aziz bin Abdul Razali (Director of Pahang State Prison), Ybhg KJP Dato’ Sakeri bin Haji Dollah (Director of Vocational and Industry Division) and Ybhg KJP Dato’ Sri Haji Zulkifli Bin Omar (Director of Malaysian Prison) along with Ms Katherine Chew, Vice President of Resort Communications and Public Relations and Executive Chef Alex Vitalise of Resorts World Genting. Focusing on educating female inmates and female staff of Bentong Prison, the programme covered issues such as food hygiene, kitchen management, culinary technology, dietary nutrition, recipe commercialisation and food industry opportunities, all in the name of ensuring that the inmates have opportunities to support themselves once released. The Bentong Prison prides itself on its Pastry Workshop that supplies the products produced by the inmates to external parties such as donuts, ‘muruku’ and cookies that channels the income back to them.